Hello from Long Lane Honey Bee Farms, and welcome to today's lesson in Beekeeping on hygienic behavior and testing for mites using a powder sugar roll. As I have written nearly sixty lessons, I have never written a lesson on the bee dance. So today, as fascinating and complicated as it is, I want to teach on the way bees communicate through dance. Before I do, let me tell you about some things we are doing here at Long Lane Honey Bee Farms. It has been a great bee year for us. Our hives have all built up nicely and are very strong, honey production has been great and best of all, no problems with pests or diseases since we have been free of using chemicals for nearly 3 year now. Queen production has been very robust! 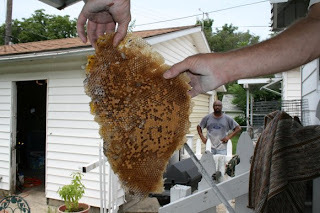 I removed another colony of bees from a home in Champaign, Illinois. The location of the bees was another first for us. This time, they were harder to located because they were going into a hole between the wall and the top step on the back porch. 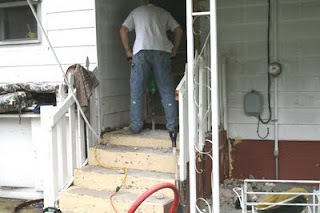 After some investigation, I determined that the steps had a hollow cavity in the middle, and so after the owner rented a jack-hammer and after we busted open the porch, we were right. In 1954 when they poured the concrete they placed a wooden whisky or pickle barrel in the middle to lessen how much concrete it would take. The bees thought this would be a perfect place for a hive. As you can see they build layers and layers of comb inside this nice size cavity. This was the first time I ever operated a jack-hammer, and I now have a greater respect for those who run these things all day long. We always use our bee vac for removal jobs and without it we'd never get all the bees. This was a very challenge removal just because the concrete was so old and hard. 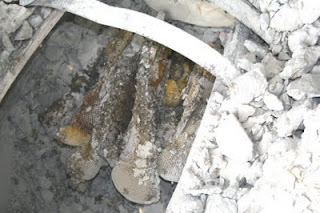 But once we got through and found the barrel, then we were able to remove the comb and bees. The owner was very happy that we found the bees and took them away! Remember, we really appreciate your business. We are here to serve all beekeepers as beekeepers ourselves, and as our customers will affirm, we do our best to answer your questions. So, when you are considering purchasing packages, nucs, woodenware, protective clothing, extracting equipment, queens, etc., please be sure to give us a call: 217-427-2678. We all probably remember in grade school that bees do a wagtail dance, sometimes referred to as the waggle dance. If we were paying attention in elementary school, we also learned this dance is performed by a foraging honey bee, a female bee that has discovered a great source of nectar and/or pollen from flowers and she returns to the hive and dances to tell the other bees how to get there. The dance communicates three things: 1) Directions to the source 2) A sample of the source and 3) How far away it is. We have an observation hive at our honey bee farm and customers and students always love finding and watching bees doing the wagtail dance. Dr. Karl Ritter von Frisch (1886-1982)receives the credit for spending his life working with bees and unraveling the dance mystery. As he continued to work with bees and other insects he eventually won the Nobel Peace Prize for his work. Others were, at first, skeptical as to the scientific merit behind his explanation of the bee dance. Anyone can now study the bee dance with an observation hive, a bowl of sugar water and a few marked foraging bees. Foragers scouting around for nectar sources will land on a great find, maybe a large patch of flowers yielding much nectar and pollen. They fly back to their hive with a sample of pollen on their legs and nectar in the honey stomachs. Now, they must convince other foragers in the hive that it is worth the trip. They do so by giving the foragers in the hive a sample of the nectar and pollen. Then, with great vigor they dance in order to tell the other bees where the nectar is located and how far away. Without becoming too technical, let me say that if the nectar source is less than 100 yards from the hive, then the foragers do what is called a round dance. They simply vibrate in a circle. This means that the nectar is out side near the hive, go and find it! We've also learned the difference races of bees have slight variations of dances, such as the Italians who use a sickle dance when the nectar is between 10 - 30 yards from the hive. The dancer use the sun outside the hive to navigate to the nectar source, but inside the hive, she must translate the sun's location by gravity orientation on the comb. The forager doing the dance communicates how much energy will be needed to fly to the nectar source. This helps the other foragers determine the distance. And somehow, the dance also takes into consideration the changing position of the sun as it gets later in the day. Even head wind is taken into consideration in the dance. The dancer also gives off pheromones and sounds to assist as well. As a beekeeper, you'll enjoy watching the dance when you lift out a frame on a nice warm day during a heavy nectar flow. You might see many bees on one frame dancing like crazy. Isn't it amazing how bees communicate? And a late breaking discovering now tells us that bees change their waggle dance if the flowers poses some sort of threat. It's found in the journal Animal Behavior. BBC Earth News, Mark Walker reports that "Scientists Kevin Abbott and Reuven Dukas of McMaster University in Hamilton, Ontario, Canada. that these scientist "have found that honeybees use the waggle dance to do more than just encourage others in their colony to visit bountiful flowers...They trained honeybees to visit two artificial flowers containing the same amount and concentration of food. They left one flower untouched, making it a "safe" food source for the bees. On the other flower, they placed the bodies of two dead bees, so they were visible to arriving insects, but would not interfere with their foraging. A crab spider kills a flower visiting wasp. They then recorded whether and how the bees performed a waggle dance on their return to other members of the hive colony. On average, bees returning from safe flowers performed 20 to 30 times more waggle runs that bees returning from dangerous flowers. That shows that the bees recognise that certain flowers carry a higher risk of being killed or eaten by predators, such as crab spiders or other spider species that ambush visiting bees. What's more, they factor this risk into their waggle dances, tempering them to steer their colony mates away from flowers that might be dangerous." Enter your Email and we'll send you these lessons automatically FREE! Unsubscribe at any time. You can easily unsubscribe at any time and it's free. Since these lessons are free, it doesn't take a rocket scientist to figure out that it does take money and time to put each lesson together. We receive alot of "thank you" emails and phone calls, telling us that these lessons have helped beekeepers greatly. We have been migrating more of our lessons from our blog site over to our website, so be patient with us until we complete the migration. I'll update the blog from New York if I have time and until next time, remember to BEE-have yourself!